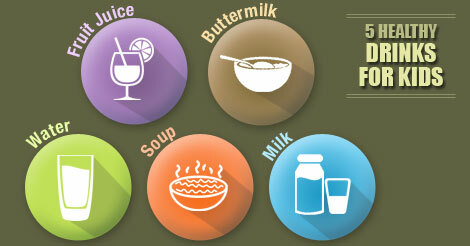 Milk is known as complete food since it can provide all the major nutrients like carbohydrate, proteins, and fats. Milk is also loaded with vitamins like A, D, E, and K along with vitamin B-12, thiamin, and riboflavin. Furthermore, milk is a very good source of minerals like calcium, magnesium, phosphorus, potassium, selenium, and zinc. These minerals are crucial for bone health and hormonal balance in growing kids. Flavors like chocolate, cardamom, saffron, and almonds can be used to enhance the taste of milk and thus make the fussy kids drink it. Fruit juices are a very good and tasty option for the kids who avoid eating their fruits as a whole. Juices of citrus fruit like oranges, mousambi, lemon, and grapefruit are a great source of vitamin C, vitamin B1, pantothenic acid, and folate. Juices of fruits like apple, grapes, pomegranate, watermelon, and others are an abundant source of vitamin A, calcium, copper, and fiber. One need to remember that the juices lose their nutritional value on storage and thus readymade drinks are often useless. Buttermilk is an amazing probiotic drink filled with the goodness of calcium, proteins, and riboflavin. Also, the drink is low in fat and calorie counts. According to Ayurveda, buttermilk is ‘cool’ in inherent nature and thus prevent from derogatory effects of scorching heat. Thick and tangy soups made with tomatoes, carrots, and other vegetables can be used as a perfect evening time drink alongside a small snack. Adding a little bit of sugar, cream, and grated cheese makes the kids love it and ask for more. Soups are a perfect substitute for cooked vegetables which kids often avoid. Benefits of water as a drink are often underestimated. Intake of at least 2-3 glasses of water along with another fluid is of utmost importance to avoid problems like dehydration and constipation in the children. Parents must ensure that the child drinks a glass of water after physical activities like dancing or playing in order to replenish the water lost through sweating.